The universe was born with the Big Bang as an unimaginably hot, dense point. When the universe was just 10-34 of a second or so old — that is, a hundredth of a billionth of a trillionth of a trillionth of a second in age — it experienced an incredible burst of expansion known as inflation, in which space itself expanded faster than the speed of light. During this period, the universe doubled in size at least 90 times, going from subatomic-sized to golf-ball-sized almost instantaneously. The work that goes into understanding the expanding universe comes from a combination of theoretical physics and direct observations by astronomers. However, in some cases astronomers have not been able to see direct evidence — such as the case of gravitational waves associated with the cosmic microwave background, the leftover radiation from the Big Bang. A preliminary announcement about finding these waves in 2014 was quickly retracted, after astronomers found the signal detected could be explained by dust in the Milky Way. According to NASA, after inflation the growth of the universe continued, but at a slower rate. As space expanded, the universe cooled and matter formed. One second after the Big Bang, the universe was filled with neutrons, protons, electrons, anti-electrons, photons and neutrinos. During the first three minutes of the universe, the light elements were born during a process known as Big Bang nucleosynthesis. Temperatures cooled from 100 nonillion (1032) Kelvin to 1 billion (109) Kelvin, and protons and neutrons collided to make deuterium, an isotope of hydrogen. Most of the deuterium combined to make helium, and trace amounts of lithium were also generated. For the first 380,000 years or so, the universe was essentially too hot for light to shine, according to France's National Center of Space Research (Centre National d'Etudes Spatiales, or CNES). The heat of creation smashed atoms together with enough force to break them up into a dense plasma, an opaque soup of protons, neutrons and electrons that scattered light like fog. Roughly 380,000 years after the Big Bang, matter cooled enough for atoms to form during the era of recombination, resulting in a transparent, electrically neutral gas, according to NASA. This set loose the initial flash of light created during the Big Bang, which is detectable today as cosmic microwave background radiation. However, after this point, the universe was plunged into darkness, since no stars or any other bright objects had formed yet. About 400 million years after the Big Bang, the universe began to emerge from the cosmic dark ages during the epoch of reionization. During this time, which lasted more than a half-billion years, clumps of gas collapsed enough to form the first stars and galaxies, whose energetic ultraviolet light ionized and destroyed most of the neutral hydrogen. Although the expansion of the universe gradually slowed down as the matter in the universe pulled on itself via gravity, about 5 or 6 billion years after the Big Bang, according to NASA, a mysterious force now called dark energy began speeding up the expansion of the universe again, a phenomenon that continues today. A little after 9 billion years after the Big Bang, our solar system was born. The Big Bang did not occur as an explosion in the usual way one think about such things, despite one might gather from its name. The universe did not expand into space, as space did not exist before the universe, according to NASA Instead, it is better to think of the Big Bang as the simultaneous appearance of space everywhere in the universe. The universe has not expanded from any one spot since the Big Bang — rather, space itself has been stretching, and carrying matter with it. Since the universe by its definition encompasses all of space and time as we know it, NASA says it is beyond the model of the Big Bang to say what the universe is expanding into or what gave rise to the Big Bang. Although there are models that speculate about these questions, none of them have made realistically testable predictions as of yet. The globular cluster NGC 6397 contains around 400,000 stars and is located about 7,200 light years away in the southern constellation Ara. With an estimated age of 13.5 billion years, it is likely among the first objects of the Galaxy to form after the Big Bang. The universe is currently estimated at roughly 13.8 billion years old, give or take 130 million years. In comparison, the solar system is only about 4.6 billion years old. This estimate came from measuring the composition of matter and energy density in the universe. This allowed researchers to compute how fast the universe expanded in the past. With that knowledge, they could turn the clock back and extrapolate when the Big Bang happened. The time between then and now is the age of the universe. Scientists think that in the earliest moments of the universe, there was no structure to it to speak of, with matter and energy distributed nearly uniformly throughout. According to NASA, the gravitational pull of small fluctuations in the density of matter back then gave rise to the vast web-like structure of stars and emptiness seen today. Dense regions pulled in more and more matter through gravity, and the more massive they became, the more matter they could pull in through gravity, forming stars, galaxies and larger structures known as clusters, superclusters, filaments and walls, with "great walls" of thousands of galaxies reaching more than a billion light years in length. Less dense regions did not grow, evolving into area of seemingly empty space called voids. Until about 30 years ago, astronomers thought that the universe was composed almost entirely of ordinary atoms, or "baryonic matter," According to NASA. However, recently there has been ever more evidence that suggests most of the ingredients making up the universe come in forms that we cannot see. It turns out that atoms only make up 4.6 percent of the universe. Of the remainder, 23 percent is made up of dark matter, which is likely composed of one or more species of subatomic particles that interact very weakly with ordinary matter, and 72 percent is made of dark energy, which apparently is driving the accelerating expansion of the universe. When it comes to the atoms we are familiar with, hydrogen makes up about 75 percent, while helium makes up about 25 percent, with heavier elements making up only a tiny fraction of the universe's atoms, according to NASA. The shape of the universe and whether or not it is finite or infinite in extent depends on the struggle between the rate of its expansion and the pull of gravity. The strength of the pull in question depends in part on the density of the matter in the universe. If the density of the universe exceeds a specific critical value, then the universe is "closed" and "positive curved" like the surface of a sphere. This means light beams that are initially parallel will converge slowly, eventually cross and return back to their starting point, if the universe lasts long enough. If so, according to NASA, the universe is not infinite but has no end, just as the area on the surface of a sphere is not infinite but has no beginning or end to speak of. 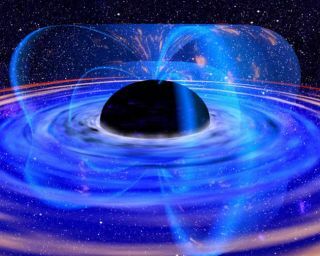 The universe will eventually stop expanding and start collapsing in on itself, the so-called "Big Crunch." If the density of the universe is less than this critical density, then the geometry of space is "open" and "negatively curved" like the surface of a saddle. If so, the universe has no bounds, and will expand forever. If the density of the universe exactly equals the critical density, then the geometry of the universe is "flat" with zero curvature like a sheet of paper, according to NASA. If so, the universe has no bounds and will expand forever, but the rate of expansion will gradually approach zero after an infinite amount of time. Recent measurements suggest that the universe is flat with only a 2 percent margin of error. It is possible that the universe has a more complicated shape overall while seeming to possess a different curvature. For instance, the universe could have the shape of a torus, or doughnut. In the 1920s, astronomer Edwin Hubble discovered the universe was not static. Rather, it was expanding; a find that revealed the universe was apparently born in a Big Bang. After that, it was long thought the gravity of matter in the universe was certain to slow the expansion of the universe. Then, in 1998, the Hubble Space Telescope's observations of very distant supernovae revealed that a long time ago, the universe was expanding more slowly than it is today. In other words, the expansion of the universe was not slowing due to gravity, but instead inexplicably was accelerating. The name for the unknown force driving this accelerating expansion is dark energy, and it remains one of the greatest mysteries in science. Additional reporting by Nola Taylor Redd and Elizabeth Howell, Space.com contributors.